It has been a long time I wrote something on this QSL of Conduct site. It is also a long time ago amateurradio operators begun with the habit of exchanging QSL. This video shows how a vintage QSL is printed. For a while now I asked myself how on earth I can get QSL returned via bureau. Most of the time I only answer bureau cards. It has been very rare I send my QSL card first. Unfortenately I dumped a lot of less interesting cards in the garbage (oh my!) So from the 3 cards at the right I could not find DF8JE. I found the QSL manager from A61BM is IZ8CLM, it is printed on the card so it is my own fault. I will send the A61BM card again. The last card is from Z60WW, their card does not have a TNX/PSE QSL sign printed on it. I guess it is my fault, I tried to return a card. However it reached me via the bureau so I presumed I could return a QSL via bureau. It did happen before but those cards are all gone in the garbage, I didn't investigate why they had been returned. I remember 2 times the operator was SK. But others could be send via a QSL system like GlobalQSL. If you receive those cards via bureau and the station is not participating the return QSL will get back to you. 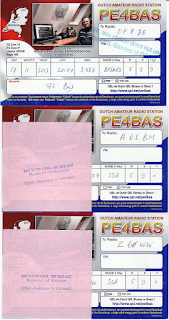 It is important that it is clear how to return a card, print it on your card near the PSE/TNX QSL sentence. 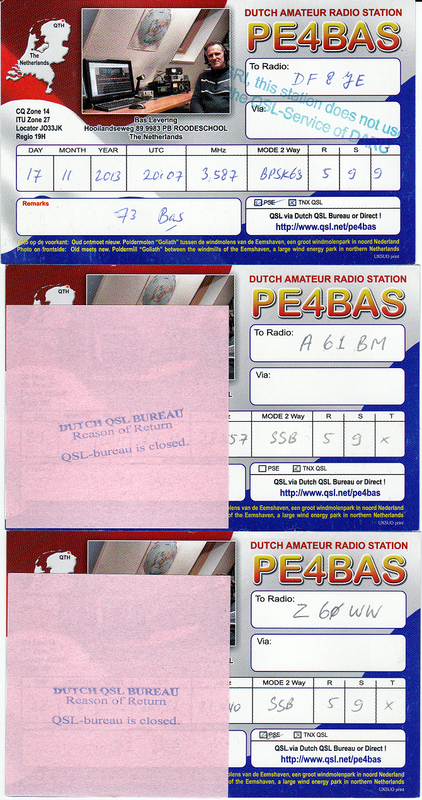 Otherwise others presume they can return a QSL card via bureau. Tell me, what are you doing with received paper QSL cards? Personally I never look at them once when I answer them and put them as received in my logbook. After that I never look at them again. Sometimes I scan the nice ones to keep them on the computer. I actually did throw a box full of cards away. Why keep them? I know people that have boxes full of cards stored on the attic. That means not 1000 or 2000 but more then 10000-20000 QSL cards they never look at. "QSL will always be answered 100% as long as you are in the log. SWL QSL welcome, please note the callsign of the station I was contacting and the right log info. I prefer QSL via the digital way it is cheap, easy and much better for the environment." Yes I prefer my QSL the digital way via the internet. I think paper QSL is nice and something you can touch. I still respect people that want my paper QSL card. I can imagine you find them valuable and when you make about a hundred QSO a year you can handle it and it is like you have a treasure in your hand when you receive them. But what about 2000-3000 QSL a year, imagine that. So much paper is not a treasure anymore but a weight that is burning your hobby budget. Digital QSL like eQSL and LOTW is much easier, cheaper and....when you think about it, much better for the environment. If you receive a QSL card via buro, reply via buro. If you receive QSL card direct, reply direct. Of course if you receive a digital QSL reply the same way. And try to find out what sort of QSL someone prefers before sending that first QSL.